This has been a very productive week on a theoretical level, and a slightly less productive week on a practical level. I’ve made some “big choices” , as it were, about my current writing projects and it feels great to put some of my questions marks behind me. The biggest of the two choices was settling on a path to go down with my next release, the sequel of Going Home. I had been struggling a bit with how to structure it but I think I’ve solved that now. My solution involves expanding the story beyond the original scope. In the end I estimate about 60% of the story will be my original draft, so it’ll be quite a lot of extra work but in the end I think it’ll be worth it. 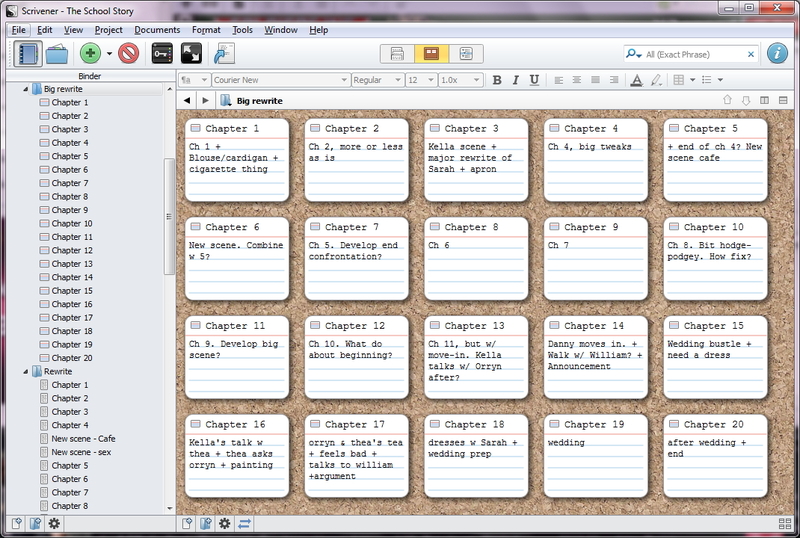 I even made an outline of the “new” story today in Scrivener! I do love the cork-board feature. It’s so handy. Don’t look to closely if you want to avoid spoilers though! 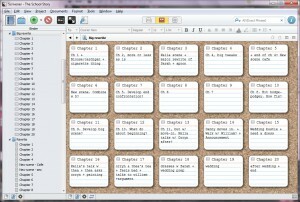 Finished my pre-editing of the sequel, decided where to go with the rewrite and made the outline above. Picked a title for the sequel! I need to sit on it for a few days before announcing it, though, to make sure it doesn’t chafe. Done my daily writing… sort of. I managed five days, but on those days I wrote 100+ words each. No one-haiku days! Added a few haikus to my Wattpad album. Posted on the blog about some awesome releases by friends! Aaaand…. picked a project for Camp NaNo in April. Yay! Start reworking the sequel. My goal is chapters 1-7. Of those, 2 are only half drafted, another 3 need fairly extensive changes and the remaining 2 are more or less being kept intact (until the finer editing starts, that is). Make an outline for my Camp NaNo project. It’s a bit early for being me, but this project has more characters and sub-plots than what I normally work with so I want to have plenty of time to prepare. Upload even more haikus on Wattpad. Post about… something. On Friday. Haven’t decided what yet. Right, I’m off to write a grocery list. It’s almost pay-day, after all! This entry was posted in Twice Fortnightly and tagged camp nanowrimo, choices, daily writing, drafting, editing, haikus, outline, releases, scrivener, tribe, twice fortnightly, wattpad by Emma Lindhagen. Bookmark the permalink. Next → Next post: Word Cloud of Going Home!